Bathco has built an international reputation as a vital service provider to the Aluminium industry for raw materials and equipment used in Aluminium electrolysis. Our vision is to be the most reliable, high quality and resourceful partner for Aluminium related raw materials worldwide. Our Management Team – Together, with their teams of dedicated professionals, they lead and manage Bathco in its global operations. Andreas is responsible for the day-to-day business and the groups global trading activities. He is now based in Zurich, Switzerland and before spent several years in Asia and Africa at the groups’ subsidiaries. He has been in the commodities business since the year 2000 and assumed responsibility for Bathco in 2008. Andreas holds a Bachelors’ degree in Business Administration. Andreas is in charge of the operations of the industrial activities within the Bathco Group, he is based in Zurich, Switzerland and before spent several years in Asia and Africa. He holds a Master in Marketing, Services and Communication Management from the University of St. Gallen, Switzerland and joined the Bathco Group in 2009. Bathco is privately owned with sales offices in Switzerland and China. Our neutrality within the supply chain affords us the ability to partner with any supplier and contract with any consumer. This enables us to balance supply and demand on a global scale. We are uniquely qualified to objectively assist our clients in optimizing their processes and reducing operating expenses. Our unique industry position, extensive experience and global resources enable us to provide flexible, responsive solutions that are cost effective and easily managed while adhering to the highest standards of ethics, social responsibility and environmental impact. Bathco offers short- and long-term contracts as well as spot buys. Our experience not only includes a long track record of assisting startups, but also a history of accepting varying levels of quality in Bath Material. We have strength in taking alternative and special quality Bath Material and processing it in a way to find a suitable buyer. 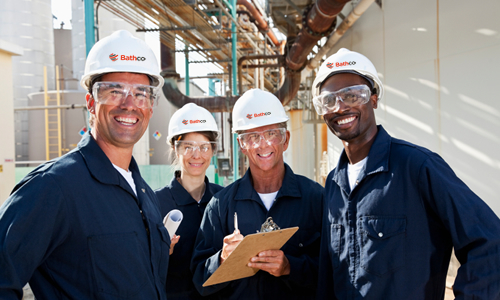 With guidance from the management team, Bathco is committed to excellence. We partner with and serve like-minded others within the industry to cooperatively lead the way forward with the highest standards of corporate citizenship.